I spent two days this week at Mammoth Cave National Park. I never saw any caves. I met with a former Job Corps center director that was at Mammoth Cave when the Great Onyx Job Corps Conservation Center opened in June 1965. He hopes to write a book about the center’s early history and his experiences there. We compared notes, visited the former center site and current center, and met with park resources staff. Visitor Center completed in 2012. 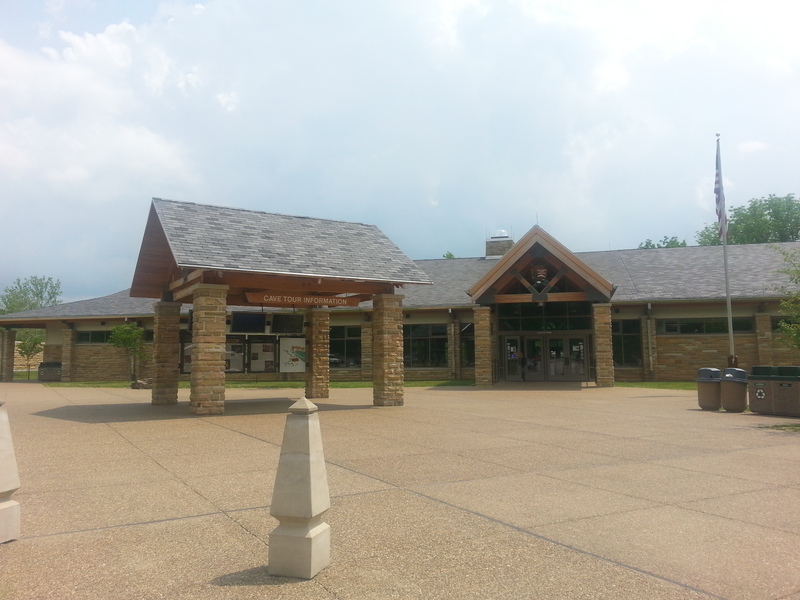 When I first arrived, I did a brief loop around the new park visitor center and museum, which opened in 2012. The museum obviously focuses on caving, but it does have an exhibit panel on the families that lived in the park (later I learned that there were 643 families in the park area!) and the Civilian Conservation Corps. The NPS dedicated the new park in 1941 and had four CCC camps during the New Deal. 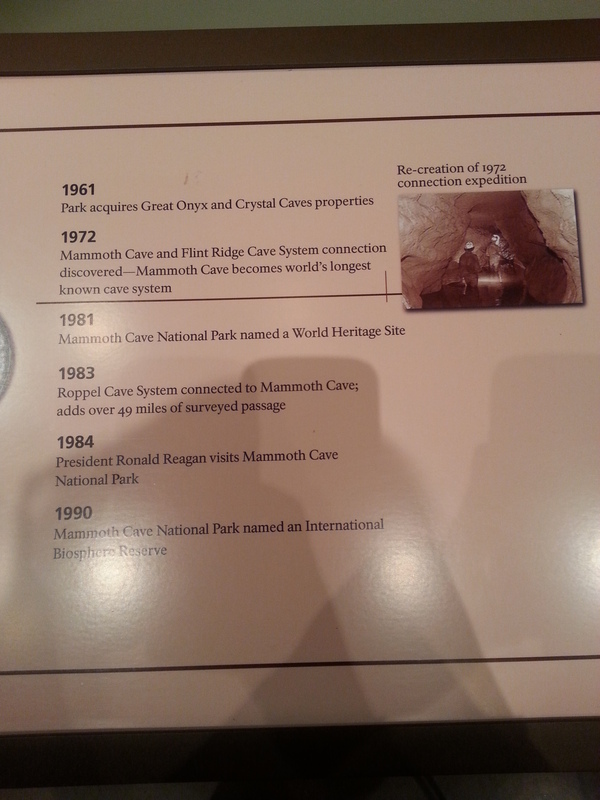 The exhibit includes a timeline of the cave’s history all the way up to 2012 and marks significant events in the park’s development. The Job Corps is notably absent from the panel, although the CCC is referenced. 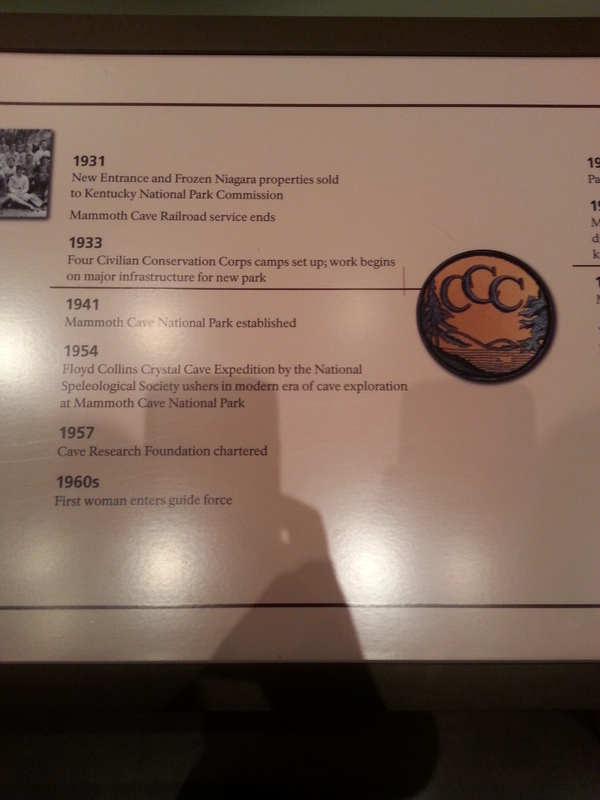 Timeline in Mammoth Cave exhibit noting impact of CCC. Very little remains of the first Great Onyx Job Corps Center, which is unfortunate because it has a very interesting story. According to park staff, a group from Chicago built the Blue Grass Country Club and Golf Course on the site (now referred to as Flint Ridge) in 1919. The business did not last long because the climate meant a very short golf season. The CCC chose the golf course for its first CCC camp and placed an African American company there. The CCC tried to move the African American company elsewhere in the park, but received resistance from the local community and so they went to Fort Knox instead. 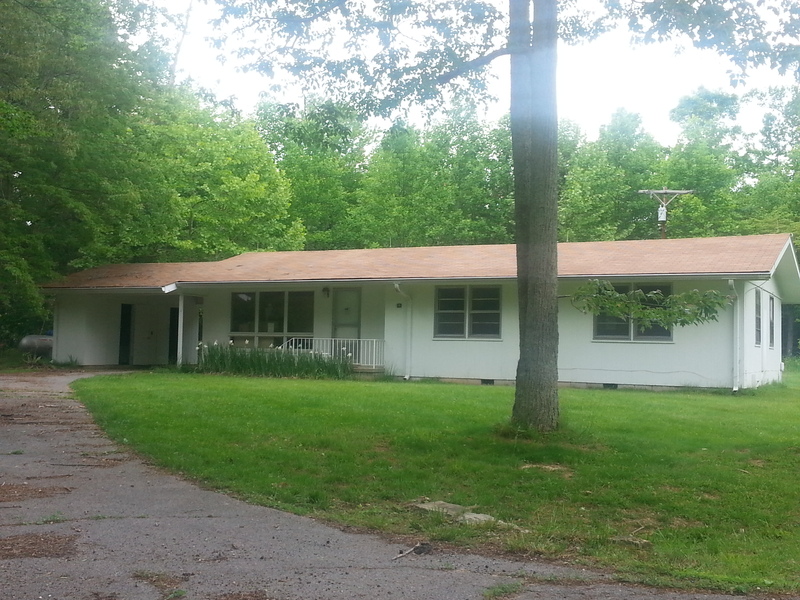 The company returned to Flint Ridge, which the CCC named “Camp Mammoth.” Similar to the Catoctin Job Corps Center, the Office of Economic Opportunity and NPS chose the former CCC site as a Job Corps center location in 1964. The center opened in June 1965. The Great Onyx center survived the 1969 cuts, which closed most of the centers administered by the NPS. However, the center moved to a new location several years later. Apparently a sewage lagoon was leaking into the Chrystal Cave below causing environmental issues. The Job Corps relocated the Great Onyx center across the river where it remains today. 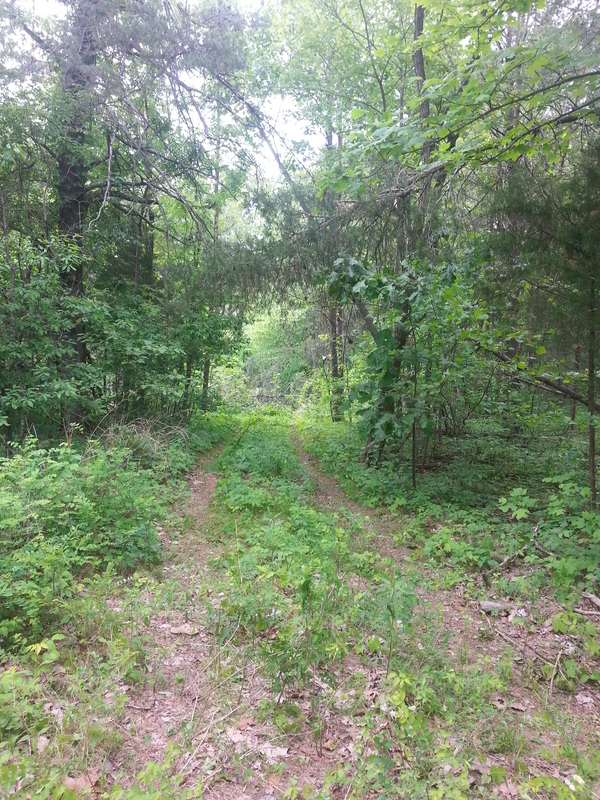 View down road leading to former Great Onyx Job Corps Conservation Center site at Flint Ridge area of Mammoth Cave National Park. We had a chance to tour the new center where we met with staff and some of the corpsmen (although the corpsmen now refer to themselves as students). Much of the structure and goals from the War on Poverty remain today. This center is residential and serves young adults along the east coast. But now this center is co-ed and administered by the U.S. Forest Service. Students can train in carpentry, plumbing, welding, urban forestry, computer tech, and business administration. One of the more successful programs is the urban forestry program, which trains students to trim and remove trees in populated settings. The instructor proudly pointed out that many of his students are in high demand and go on to have successful careers in top-tier companies. It seems that these urban foresters are carrying on the CCC’s legacy in conservation training. 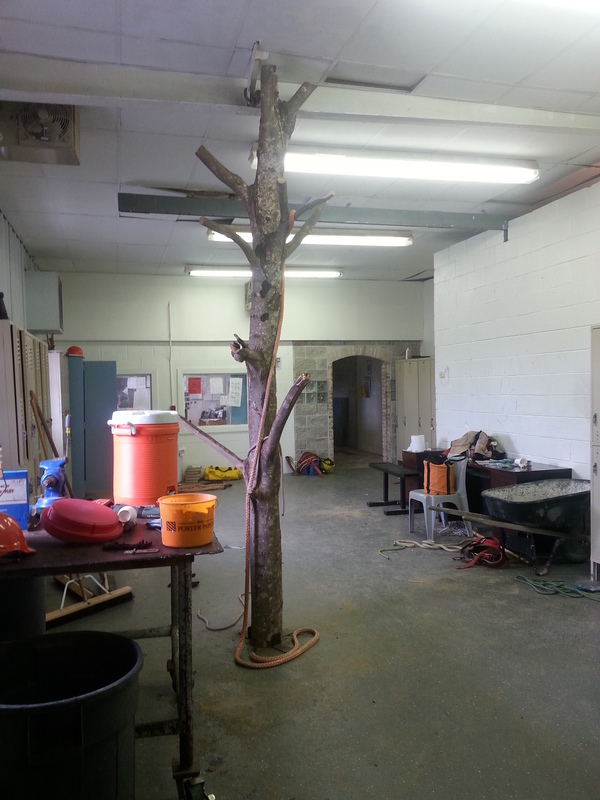 Inside the Urban Forestry classroom at present Great Onyx Job Corps Center. Students use tree to learn how to tie different knots and other skills. While not much remains of the first Great Onyx Job Corps Center, the work of the corpsmen lives on in the park landscape. I saw almost ten buildings from the Job Corps-era in the central administration area. These buildings co-exist with structures built by the CCC creating a fascinating landscape of both New Deal and Great Society architecture. This occurs in two distinct areas of the central administration area: facilities management and housing. Corpsmen also did a significant amount of work outside the park in local communities. I would like to know if any of those work projects remain today. Two CCC-era maintenance buildings flank a long Job Corps shop and garage. All are still in use today. 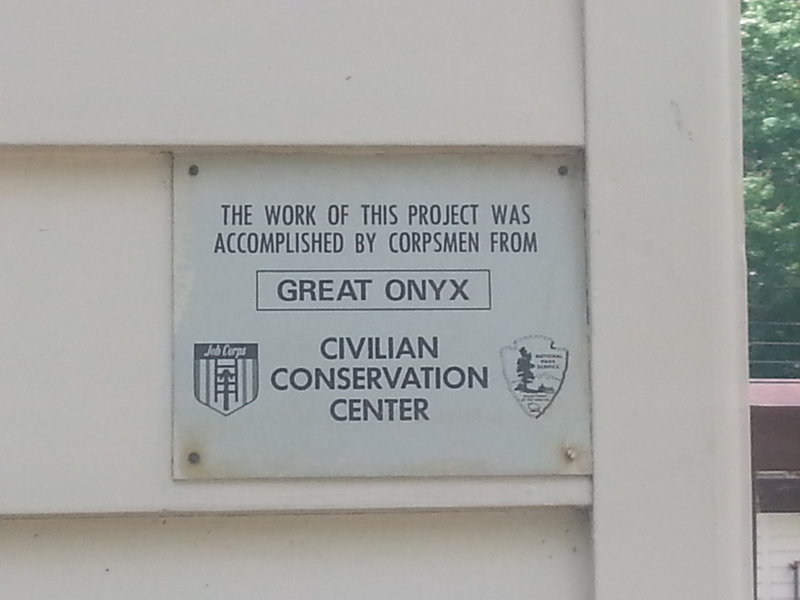 Plaque on seasonal housing dormitory indicating that it was built by the Great Onyx Job Corps. Cluster of New Deal houses built for staff quarters. 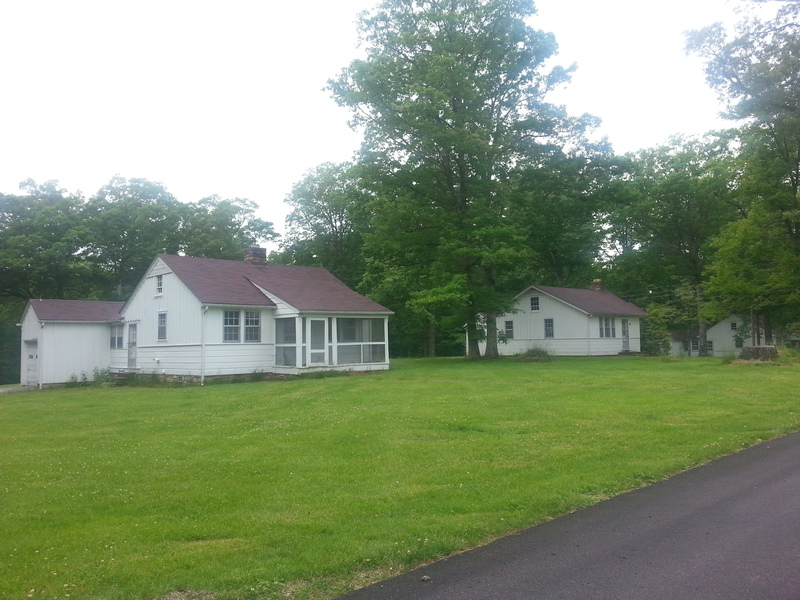 House that was identified as being built by Job Corps across the lane from New Deal park staff quarters. There are also MISSION 66 houses in this area. I believe that Mammoth Cave shares similarities to both Catoctin and Cumberland Gap and is an interesting point of comparison for the two. I think the park could benefit from a study on social reform programs (similar to the one at Catoctin), which would shape how the park’s history is interpreted. It also contributes to our understanding of park development in Appalachia. Like Cumberland Gap, this park has a long history of human occupation and as a park staff person told us, “wilderness” was the “dirty word” in the 1960s. This park had the added pressure of dealing with concessioners and science-oriented friends groups, notably the Cave Research Foundation. Special thanks to park and Job Corps staff for being so accommodating, curious, and helpful! My apologies to the Job Corps students who thought I was a new enrollee touring the center. Informitive article. I just received a job offer to work there as an instructor. He looks to be a great fit for me.